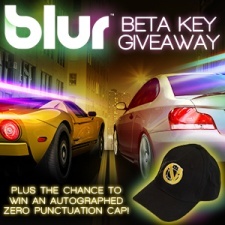 The Escapist is giving away 1000 beta keys for Activision's upcoming release, Blur on Xbox LIVE for all Gold Members. You do not want to miss out on this twist on racing and action. As an added bonus, answer our questions about the demo correctly and you'll be entered into a random drawing for one (1) of two (2) Zero Punctuation caps signed by Yahtzee Crowshaw! We will be giving out these keys until March 17th at 11:59PM EST or earlier, when all 1000 have been given away. To get started, visit the contest page here.